To win a copy of Alan Gibbons' YA novel about women in the Russian revolution, just answer the question below in the Comments section. "Who is your favourite radical, revolutionary or rebellious figure in history, and why?" We are sorry that our competitions are open to UK Followers only. My amazing friend is far more organised than I and sent me a photo of her take on the traditional carved pumpkin – this truly stupendous ‘Cat O’Lantern’ (I advised that the whiskers were necessary, so I think I get to take some credit for this masterpiece of vegetable artistry). As I gazed in awed wonder at its glowing glory, however, I got to wondering about the history of this (actually, when you think about it) rather odd tradition. I knew of course, like most people, that Halloween in its current form is a relatively new phenomenon, although the roots go back a long way. But what about the pumpkins with faces? It turns out that they too, are older than I thought. The original Jack O’Lanterns were carved, not from pumpkins, but from turnips, and the practice was recorded in both Ireland and parts of England in the early nineteenth century, although the tradition is said to be much older. The faces, with a small ember or stub of candle in them, were designed to ward off evil spirits. In America, Irish immigrants continued the tradition, only now with the native pumpkin. I’m afraid it all seems like a bit too much work to me – so I shall continue to admire my friend’s feline-veggie handiwork and settle down to watch the Strictly results! 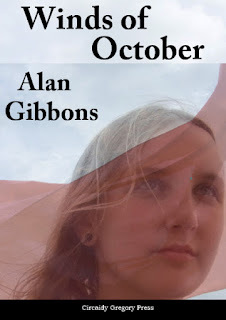 Our guest for October is History Boy Alan Gibbons. October 2017 is a significant date in modern history and Alan has found a way of showing the role of women at that momentous time. Alan Gibbons is a full-time writer. Born in 1953, Alan has written some seventy children’s and Young Adult books. The Revolution Trilogy is his first attempt at adult fiction. Winner of the Blue Peter Book Award “The Book I Couldn’t Put Down” and seventeen other awards, Alan has also been shortlisted twice for the Carnegie Medal. 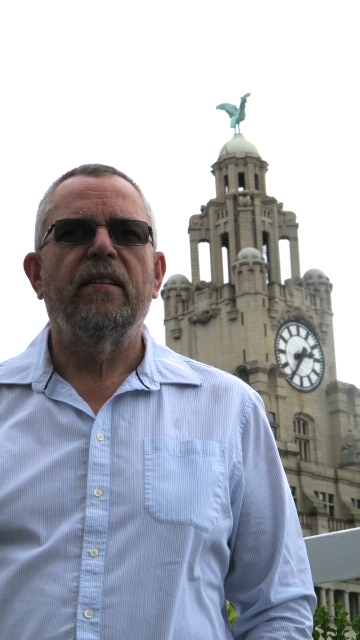 An honorary member of the librarians’ professional body CILIP and recipient of the Frank Jarvis Award for services to education, Alan has visited two thousand schools in the UK and overseas. He lives in Liverpool with his family. We have male guest authors quite rarely so welcome to Alan. Few events in history have divided opinion like the Russian Revolution. It reinforced enmities between the political Left and Right. People took sides when a savage Civil War erupted in early 1918, much of the Labour movement instinctively supporting the Red armies, most of the political establishment favouring the Whites. US, French, British and Japanese forces were just some of the interventionist armies that put boots on Russian soil. This wasn’t the only split. It also divided the Labour movement itself, parties of the Left suffering a dramatic schism between social democracy and communism. Anyone who remotely flirted with the radical Left prior to the collapse of Stalinism in the late 1980s and early 1990s will have been told to ‘go back to Russia’ more than once. Now, I am a writer, mainly of Young Adult fiction, who has roots in the political Left, so I have done a lot of recreational reading about Russia over the years, from the Marxist tradition and its opponents, Lenin, Trotsky, Isaac Deutscher, Victor Serge, Paul Avrich, Orlando Figes, Robert Service and many others. I have enjoyed literature from the period of the revolution: Isaac Babel, Mikhail Bulgakov, Victor Serge again, Boris Pasternak and Alexander Solzhenitsyn. As the anniversary of the Russian Revolution approached, I fully expected an outpouring of fiction set against the Russian Revolution, only it didn’t happen. Theresa Breslin has a new novel, The Rasputin Dagger, but there hasn’t been much else. I was in Moscow last year. Not only was there little sign of any commemoration of the two revolutions in 1917, in February and October, there seemed to be genuine ignorance of the events. 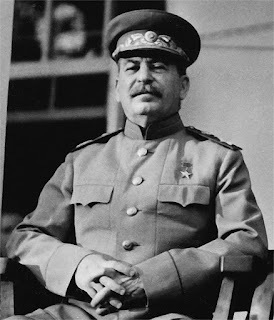 People knew about the ‘Great Patriotic War’, many Russians’ name for the country’s involvement in World War Two from 1941 to 1945. Some described the revolution to me as ‘the great catastrophe.’ It was much the same in the UK. There was an exhibition at the British Library, but little else. As time went by, I thought, surely there has got to be something. There wasn’t. That was it, I made a last-minute decision to write something myself. That something is the Revolution Trilogy. The first book Winds of October has just been published. The second and third volumes, Reason in Revolt and Spurn the Dust come out next year. The big publishing houses didn’t seem interested so I am publishing the trilogy with a small publisher, Circaidy Gregory. I have ironically sub-titled my book "Ten Days that Didn’t Shake the World," referencing Jack Reed’s eye-witness account of the revolutionary events. Yes, I wrote Winds of October at breakneck pace in ten days this summer, eight thousand words a day. That may seem rather eccentric. So, to some, will be my approach to the novel. Much of the iconography of the revolution is male. The main players always seemed to be men: Lenin, Trotsky, Stalin, Kerensky, Kornilov, Makhno, Zinoviev, Kolchak. I became increasingly interested in the other narrative of the revolution, that of the women. After all, it was the women workers of the Vyborg district in Petrograd who came out to demonstrate on International Women’s Day and initiated the first revolution. Once I had my ‘hook’, I started to investigate. There were so many tales to tell. There were the women revolutionaries, the Bolsheviks such as Alexandra Kollontai and Larissa Reissner. The Socialist Revolutionaries such as Maria Spiridonova and Fanny Kaplan. Then there were figures such as Maria Bochkareva, commander of the Women’s Battalion of Death. From England came suffragette leader Emmeline Pankhurst and her working class colleague, Jessie Kenney. There were so many angles. My cast of characters formed. There is the student-revolutionary Kolya who becomes a member of the Cheka, the feared state police and Pavel, the Red Army commander, but it is the women who are the heart of the book, Svetlana, the factory worker and committed Bolshevik, Elena her niece, but most of all Raisa. I found her story in the tragedy of Russia’s street children, the besprizorny. By 1920 there were seven million of these ‘unattended’ children. Their parents were either dead or had abandoned their children in desperation. Raisa becomes a child prostitute, but a fortuitous event gives her a chance to escape life in a filthy brothel. The February revolution finally offers her a glimpse of a different, better world and she makes her escape, becoming a committed Bolshevik and falling in love with another woman. The trilogy follows these core characters through the hope, conflict and tragedy of the years 1917-1921. War, revolution, conflict and betrayal seem to me the stuff of historical fiction, but there is another subject that seems to go to the very heart of this strand of the genre, and that is disillusion, of hope lost and aspiration betrayed. The anniversary of the Russian Revolution may pass relatively unmarked because of the grotesque distortion of revolutionary hope represented by Stalinism, but I will have offered my own, modest account of those years, seen through the eyes of my characters. I hope it may be something of an antidote to the more distorted image of those years presented in the corporate media. 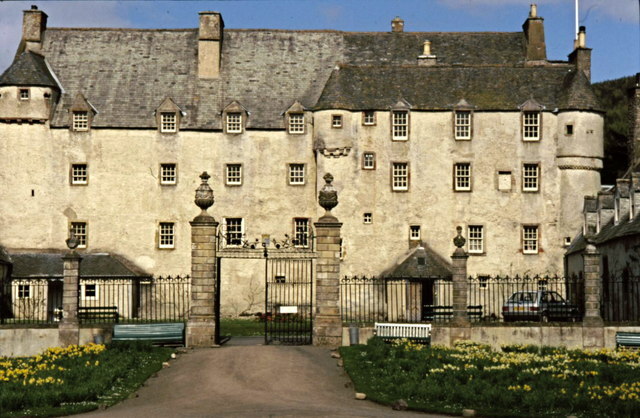 Traquair House, in the Scottish Borders, is the oldest inhabited House in Scotland. It dates back to 1107, and although it was originally built as a hunting lodge for Scottish kings and queens, it has been lived in continuously by the Stuart family since 1491. In the early 1700’s the political situation in Scotland was very unsettled, with the Catholic James II now exiled in France and deposed by his daughter Mary and her Protestant husband, William of Orange. Many Catholic Scots were fiercely against interference from the English Protestants, and remained loyal to James. Charles Stuart, the 4th Earl of Traquair, was a staunch Catholic, and became one of James’s band of supporters known as the Jacobites, who worked secretly to restore the Stuarts to the throne. It was on a visit to Traquair House that I first learnt the fascinating story of Lady Winifred Nithsdale, Charles Stuart’s sister-in-law. 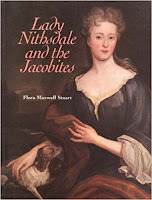 I was so interested that I subsequently bought a book called “Lady Nithsdale and the Jacobites”, by Flora Maxwell Stuart, wife of the 20th Earl and mother of the current Lady Traquair, which tells in more detail the story of this remarkable lady. In 1715 Lady Winifred’s husband, William Nithsdale, took part in the first Jacobite rebellion and was imprisoned in the Tower of London and sentenced to death. He was kept in solitary confinement on the second floor of the Lieutenant’s Lodgings, well-guarded by warders. It appeared that his only way out was going to be via the scaffold, but his wife did not intend to sit back and let this happen. With the support, both moral and financial, of her brother-in-law, Charles Stuart, Winifred decided to go to London and find a way of getting William out. Leaving her young daughter at Traquair, she made her way, with only her faithful servant Cecilia Evans for company, to London, about 400 miles away. It was a bitterly cold December, with snow covering the whole country, but this did not deter her. They set off on horseback, avoiding the main roads for fear of being stopped by the government troops, and intending to join the London coach at Newcastle. This took a few days, stopping at wayside inns overnight, but when they reached Newcastle they discovered that the coach was already full. So they rode on to York, hoping to pick up another coach there. At York Winifred did get the last place on the coach, and with Evans riding behind they set off through a fierce blizzard. Their luck didn’t last, however. After about 60 miles the coach became stuck in a snowdrift and could go no further. Undaunted, Winifred hired two more horses, and she and Evans rode the rest of the way to London, with snow sometimes so deep that the horses were almost buried. Arriving on the point of collapse after their journey, they went to stay with Winifred’s old friends, Mr and Mrs Mills in Duke Street. Despite her exhaustion Winifred went straight to the Tower to visit her husband, where, with a little judicious bribery she persuaded the warders to let her in. She found William pessimistic about her chances of setting him free, but she was still determined to get him out somehow. When she returned to Duke Street, although her hostess insisted on her going to bed for a few days to recover her strength, Winifred’s mind was busy with plans for her husband’s release. As soon as she was well enough she decided her first port of call was to the king, George I, to beg a pardon for William. Mrs Mills had a friend called Mrs Morgan who had been to the king’s court several times and knew her way around, so the two women accompanied Winifred. That avenue closed to her, Winifred then devised a very daring, plan. She explained it to her hosts and Mrs Morgan, whose help she needed, and they agreed to play their parts. Then, two days before the date set for William’s execution, she returned to the Tower and, smiling at the warders, pretended that her petition for his release had been successful, and dropping a few coins in their hands urged them to drink to the king and the prisoners’ health. Once out of their hearing, she told William what had really happened, but said if he would trust her and do everything she said, she would get him out. The following day she returned to the Tower for a “final visit” to her husband, this time accompanied by Mrs Morgan, who was wearing an extra petticoat and cloak which would not show. Once in William’s cell Mrs Morgan removed the extra clothes, had a few words with William and left. As Winifred saw her out she asked her in a loud, excited voice to find her maid quickly as she must present one final petition to the Lords that evening. She made certain the warders heard her. Returning to William’s cell, Winifred begged him to do exactly as she said, and waited for Mrs Mills to come next. Mrs Mills duly arrived, sobbing and holding up a handkerchief to her face as she passed the warders. In William’s room she hastily took off her cloak and petticoat and put on those left by Mrs. Morgan. When Mrs Mills left she walked out with her face exposed and in her new clothes, looking like a different woman. Winifred accompanied her out, asking her loudly to hurry and remind her maid to come for her, so they could go to hear the petition that evening. Again she made certain the warders heard her. Finally, returning to the cell, she helped William put on Mrs. Mills’ clothes, and told him to go out with her, holding his handkerchief to his face and sobbing as Mrs Mills had done, hoping that the warders would assume it was the same woman. Positioning herself between William and the warders, Winifred appeared to be very agitated as they walked out, and begged “Mrs Mills” to tell her maid to come without delay to accompany her to the Lords to hear the final petition. This gave her the excuse to be in a hurry to leave, and seeing her agitation the warders opened the door and let the disguised William out. Through the doorway Winifred could see Mr Mills, who was to take William to a safe house, and Evans waiting for her as promised. But she still had the most difficult part of her plan to do. Returning to William’s cell, she hurriedly shut the door behind her and talked to him as if he was still there, giving his replies in a gruff voice. She waited until she guessed enough time had elapsed for him to have been taken to the safe house, and then said goodnight, adding loudly that she was afraid something serious must have happened to delay her maid, so she would have to go on her own. She said she would come again to see him that evening, and hoped to have good news by then. She then shut the door, carefully pulling the little string that lifted the latch through to the other side, so that it could only be opened from inside. She told the servant waiting to light the candles that her husband was saying his prayers and didn’t want to be disturbed, and then, bidding the warders goodnight and muttering frenziedly about the petition, she hurried down the stairs and outside, got into a hackney coach and left. Having released William from the Tower, it was now imperative to get him away from London as quickly as possible. After a few days in hiding, with the help of Mr and Mrs Mills and other sympathetic friends, William was disguised as a footman and smuggled across the Channel to France, where the Nithsdales had friends and relatives. He begged her to go with him, but she insisted on returning to Scotland first, to collect their small daughter. This was not quite as easy as it sounded, since she was well aware that George was furious that William had escaped and she was afraid she might be accused of helping him. However, since the weather had by now greatly improved, she was undaunted by the prospect of riding all the way back to Scotland, and this she did, once again taking a cross-country route to avoid being noticed. There, having been reunited with her daughter and arranged for the contents of her house to be transferred to Traquair for safekeeping, she followed William to France and, ultimately, to Italy where they lived for the rest of their lives. However, Winifred’s troubles were still not quite over, for although she knew William was profligate, it wasn’t until he died in 1744 that she realised he had left huge debts for her to deal with. But deal with them she did, and managed to pay them all off within one year. She died peacefully in Rome in 1749. 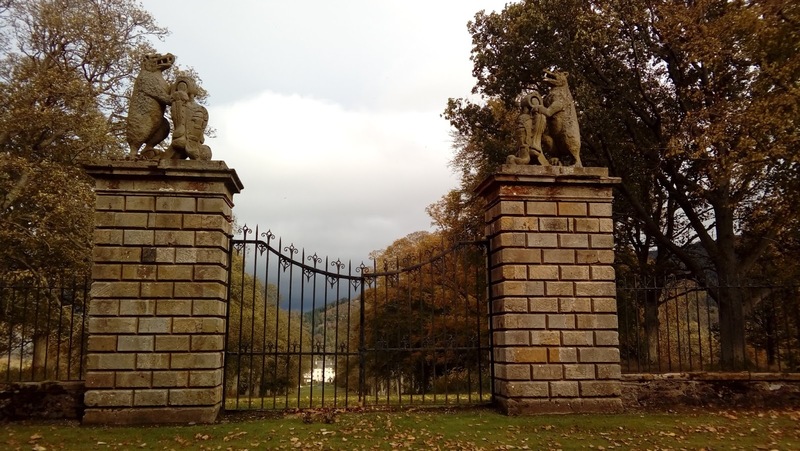 A small postscript to this story: the guide at Traquair House told us that in 1739 the 5th Earl of Traquair, like his father a staunch Jacobite, had some splendid gates built at the top of the Avenue leading to the house. With statues of bears on each gatepost they were known as the Bear Gates. Six years later, however, after a visit from James's grandson, Bonnie Prince Charlie, the Earl was so incensed by the behaviour of the next English Protestant king, George II, that he gave orders for the Bear Gates to be closed and locked, and swore that they would never be opened until a Stuart king sat on the throne again. Accordingly they have been locked ever since 1745. However, the guide said, since Prince William is a Stuart through his mother’s line, when William becomes king the Bear Gates will once again be opened. Tamara Karsavina in the studio of Wilhelm-Alfred Eberlin. His self portrait is on the shelf, 1910. This is the story of a British diplomat and a Russian prima ballerina caught up in the October 1917 Russian revolution, and their dramatic escape with their love-child. In old age, relatives sometimes reveal family stories that are not secrets, they have just not mentioned them before. In her eighties, my mother told me that her father’s cousin had been a British diplomat during the 1917 revolution, and his lover was a Russian ballerina who had first danced Stravinsky’s The Firebird. I wanted to know more, so my daughter Daisy and I flew to St Petersburg. We visited the Imperial Stage School, with its original practice rooms, and the Marinsky Theatre, unchanged since its construction in 1860. We also found their apartment, now the premises of the Russian Red Cross Society, and discovered archives no-one had seen since 1917. Henry James Bruce (1880-1951) was brought up in a stately home in Northern Ireland, built by Italian architects for his ancestor the Earl of Bristol. Henry’s father, Sir Hervey Juckes Bruce preferred animals to humans. He kept a tame grouse and a hare loose in the house; and his own pack of fox-hounds. One evening at dinner he said to the dowager on his right, "May I peel this peach for you? It’s too ripe for the monkey." Henry was educated at Eton and Oxford. In order to pass his entrance exam into the Foreign Office, he picked up French prostitutes in The Strand and gave them lunch in exchange for conversation. His good looks, intelligence and charm helped his promotion in 1913, to Head of Chancery at the British Embassy in St Petersburg at only 35 years. In addition to being highly skilled in de-cyphering codes, he was also an accomplished painter and writer. 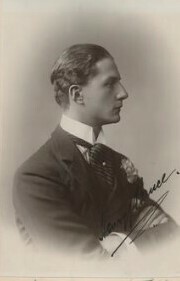 Henry James Bruce in 1907. 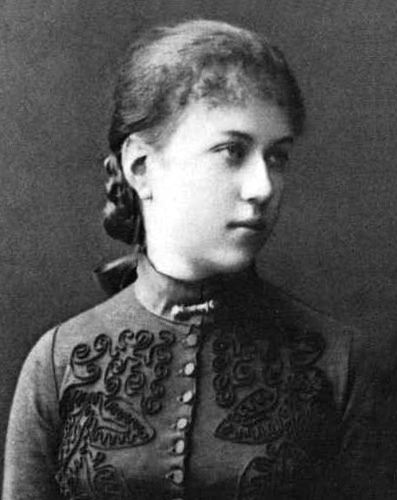 Tamara Platonovna Karsavina (1885-1978) spent eight years of her childhood coping with the strict and punishing regime of the Imperial Ballet School in St Petersburg, boarding for 50 weeks of the year. At fifteen, she performed for Tsar Nicholas II and his cousin the German Kaiser, and when she graduated aged 17 her exceptional proficiency was noticed and she was appointed as a soloist at the Marinsky Ballet. She toured Europe with classics such as Giselle and Les Sylphides. St Petersburg, 1902. Karsavina is on the far right, aged 17. Ballerinas were usually considered to be merely decorative but the Russian intelligentsia embraced Tamara. Her beauty, technical perfection and intelligence enchanted and inspired choreographers, composers and designers. As Nijinsky's first dance partner, Tamara worked with impresario Diaghilev, artists Benois, Picasso and Matisse, the poet Potemkin, and the choreographer Michel Fokine. In 1909, she introduced Diaghilev’s Ballets Russes to London and a year later inspired Igor Stravinsky to compose The Firebird . She influenced not only the theatre and dancing but also fashion, music and culture, all over Europe. Rehearsal with Diaghlev's Ballet Russe company, probably 1910. Seated at the piano is Stravinsky, Fokine is standing, Karsavina in centre in tutu. Henry and Tamara first met in 1913 at the Stray Dog Arts Café, a crowded cellar of Bohemian artists and poets. She danced barefoot among flowers to music written specially by Zelenski, played on an upright piano. Tamara had been having English lessons with the novelist Hugh Walpole (1884-1941), head of British propaganda in St Petersburg, who described Henry as "too handsome for his high intelligence". Henry and Tamara soon fell in love but she was already married to a dull aristocratic banker named Vasili Moukine. In July 1914, Tamara danced in Debussy’s Daphnis et Chloe and Strauss’s Cleopatre at London’s Drury Lane. She was performing in Paris when war broke out that August. Determined to re-join the Imperial Ballet and Henry, she learned that the Russian border with Germany was closed, so travelled alone via Dover and Finland. In 1915 Tamara became pregnant and Moukine agreed to give her up, even though divorce was not possible under Russian Orthodox law. Despite the war in Europe, Tamara and Henry continued working in Petrograd, and lived together as a family, with baby Nikita. On October 24, 1917, Henry wrote in his diary, “At 7 o’clock I left the Embassy to go to the ballet where I arrived peacefully by tram. The others [his embassy colleagues] arrived later, having all been arrested en route and taken to the barracks of the Pavlosk regiment, where they were apparently treated quite civilly and given a bit of paper to allow them to proceed.” The ballet that evening was The Nutcracker composed by Tchaikovsky in 1892, with Tamara as the Sugar Plum Fairy. “Tamara danced magnificently and had a tremendous reception. But the poor Marinsky was the ghost of itself, the stage half empty. After the ballet Tamara, Madam B and myself went by tram up to the Suviroff Square and proceeded to walk down the Millionaya, barred by pickets. The first person we met was a completely unperturbed Havery engaged in explaining to a soldier in his peerless Cockney Russian that he couldn’t help the soldier’s troubles; he had some letters to post, battle or no battle." Mr. Havery was the British Embassy messenger who had arrived in Russia 20 years earlier. Through thick and thin he ensured that embassy post was always delivered. In the preceding few days there had been intermittent gun-fire at night, but it was never clear who was shooting at whom. “Everything had been quiet in the rest of the town, so we were surprised to find the Lord’s own holy racket going on round the Winter Palace, where the Government was putting up a last stand – field-guns, machine-guns, rifle fire, a destroyer from the river et tout le tremblement. Never heard such a row. Altogether the walk a very jumpy business.” They gathered that all the lift bridges across the River Neva were up, thus cutting off the north of the city, and a destroyer was pointing its guns at the Winter Palace, at the far end of their street. There was no electricity in their apartment and to take their minds off the sound of machine guns, they played cards by candlelight. “The last thing we heard last night was that everything is in favour of the Government and the Revolutionary Committee had been arrested. After supper I escorted Madame B home to a machine-gun obbligato and so to a very noisy bed. “This morning early nobody knew what had happened, though it seemed pretty clear that the Government was down and out. This became increasingly clear as the day went on, until we heard that the whole town was in the hands of the Bolsheviks who had taken the State Bank, Telephone, etc.” The next day Henry’s diary entry said simply, "Arrived safely at the Embassy to learn that Lenin was Prime Minister, Trotzky Foreign Minister." After the October Revolution, life grew steadily worse and everyone was a potential enemy. Despite Lenin’s great plans, there were still huge debts from the 1914 war; political and social anarchy; and a collapsed economy. During that winter, food became so scarce that after performances Tamara was presented with bags of flour, instead of flowers. Even so, she sometimes fainted after dancing. Tamara was no Tsarist: during the revolution in 1905, she and her friend, the dancer Anna Pavlova, had organised a dancers’ strike in solidarity with the factory workers. Tamara was threatened with dismissal, but saved by the Tsar's amnesty for strikers. She had welcomed the Tsar's abdication in March 1917, and she was relieved when the Bolshevik government insisted that the Marinsky should continue at the state’s expense. She was voted president of the Marinsky Theatre's Soviet Council, but nobody trusted anyone. The gilded imperial eagles in the theatre were ripped down, and the attendants' satin livery was replaced with military jackets. As part of the policy of the redistribution of decision-making, the carpenters chose the Marinsky’s programme. However their choices were based not on any knowledge of opera or ballet, but on which sets were easiest to construct. There was even talk of nationalising women, in order to re-distribute the beautiful wives of merchants among the factory workers. In March 1918, fearing possible foreign invasion, Lenin moved the capital from Petrograd to Moscow, so all embassies had to move too. Three months later he declared Britain the enemy of the Bolshevik government, and British diplomats were ordered home, south via the Crimea. However, Henry travelled north to Petrograd to be with Tamara, and their 19-month-old son Nikita. In their spacious apartment in Millionaya Street, the ‘Park Lane’ of Russia, lived Nikita’s nursemaid, their Polish cook and Tamara’s old nanny. Now they also shared it with five other families, one to each room. There was only one kitchen and constant arguments between the women over the washing hanging in the passage. Water still flowed from the tap, but it was contaminated with cholera, and there was little fuel to boil it. The trees in the park had all been felled and even the wooden street cobbles had been dug up. Because Nikita was half-British, and Tamara the lover of a British diplomat, they were both at risk of being denounced as enemies and imprisoned. As Tamara recalled 12 years later: “Rumours multiplied like microbes in a diseased body. Newspapers born overnight spread panicky informations and coined libels.” Tamara and Henry decided they had to leave Russia with Nikita as soon as possible. But all routes out of Petrograd were closed. In the next instalment, find out how these lovers from opposing nations and clashing cultures, crossed lakes, marshes, forests and oceans, and survived revolution, capture and storms. Part Two is next month on November 27. Tamara Karsavina in The Firebird, 1910. Note: St Petersburg was renamed Petrograd in 1914. In 1924 it was changed to Leningrad, and back to St Petersburg in 1991. "Excellent, "I said, "I can accompany you. Where is it?" Due to the fascinating history of Castellorizo, the island claims a mere 280 permanent inhabitants. During the tourist months that number can rise to several thousand and most of those are Australians. Everywhere about us, as our luggage was wheeled by festival assistants along the narrow cobbled lane at the water's edge, English was being spoken with Aussie accents. We are a long way from Australia, I was thinking, puzzled. Over the following days as the festival unfolded by starlight I took the days to learn a little about my surroundings, including through an excellent documentary which was screened at the festival and will now be internationally distributed by Michel's company, ICTV. Beyond the Borders, a very apt nomenclature for this festival. Castellorizo or Kastellorizo, which means red rock, red stone, was ruled from the fifteenth century to the end of First World War by the Ottomans during their powerful and extensive Empire days. The film charts the island's history through its high days in the nineteenth century up to its incorporation into modern Greece in 1948. One mosque, now transformed into a museum, still stands at the far end of the harbour. It is a testament to the long gone imperialist times. In fact, there remains a very time community of Turks (about ten people) who remain on the island. The island’s wealth was earned in the nineteenth century through sponge fishing. After the demise of the Ottoman Empire, the island belonged to the French until 1921 and then to the Italians. In 1943, the British landed. For the Brits it was a strategically important spot. They evacuated the entire population to camps in Palestine to avoid fatalities if, when, the Germans attacked Kastellorizo’s busy port. In 1948, the island was finally returned to the Greeks. However, a mere handful of the refugees returned because, by the end of the war, the once-thriving harbour had been destroyed by naval attacks and fire. Most of the refugees emigrated to Australia where, today, the population of Greek “Kassies” numbers some 50,000 and rising. The Kassies worked hard, sent money ‘home’ to those who stayed behind. Slowly, over the decades, the island has been reconstructed. 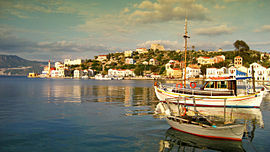 In fact, in comparison to the rest of austerity-gripped Greece, Kastellorizo is well-heeled. The mansions all around the harbour have been meticulously restored and painted in strikingly rich colours creating a vibrant, joyous welcome. Here is the link to Michel's online website. If you have any difficulty downloading the film, (there are many films on offer!) please let me know and I will help you to find it. I recommend a viewing of the film which is titled On the Edge of the Aegean, Castellorizo Island. I also wholeheartedly recommend a visit to Kastellorizo. We will certainly be returning. 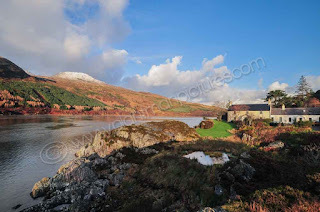 I’ve just come back from visiting friends in this remote Highland community. As you can see from this sign, Glenelg really is twinned with Glenelg on Mars. NASA's roving robotic laboratory, Curiosity, is headed for a geological feature on the Red Planet that has been called Glenelg (a palindromic name was chosen by NASA because the Curiosity rover would visit the site twice). Back on Earth, in 2012, residents of Glenelg held celebrations, including a twinning ceremony and a ceilidh. Astronomers love the area because the dark skies around Glenelg have so little light pollution that stars and the Northern Lights can be seen very clearly. According to legend, in a place where other planets and legends feel very close,the Giant Rhea heard that Glenelg was being attacked. He tried to come to the rescue, vaulting on his spear over the narrow strait, the Sound of Sleat, that separates Glenelg from Skye, but it broke in two and he drowned. So the waters just there are called the Kylerhea narrows (Kyle is Gaelic for narrows). Glenelg was once larger and more important, with a castle and a cattle market, and it appears on the map of the first atlas of Scotland, published by Joan Blaeu in Amsterdam in 1662. Before there was a ferry thousands of cows a year used to swim across from Skye. There was a rock called Calf Rock where the drovers would make a calf stand, mooing to the cows to encourage them to swim across. Thomas Telford built a curved slipway to make it easier for the cattle to climb out of the water. Close to Glenelg's low, white painted houses are the ruins of a Red Coat barracks, now ruined. Construction of the building was ordered after the 1715 Jacobite rebellion and a military road linked Glenelg to the rest of General George Wade’s road network. In 1773 Boswell and Dr Johnson, aged 63 and in poor health, came to this part of Scotland and both eventually wrote about it. Johnson’s book was called, Journey to the Western Islands of Scotland, and after his death Boswell published Journal of a Tour to the Hebrides. Johnson described the mountains in this area as "one of the great scenes of human existence." At Glenelg, "We had a lemon and a piece of bread," Johnson records, "which supplied me with my supper." “We came on to the inn at Glenelg. There was no provender for our horses: so they were sent to grass, with a man to watch them. A maid shewed us up stairs into a room damp and dirty, with bare walls, a variety of bad smells, a coarse black greasy fir table, and forms of the same kind; and out of a wretched bed started a fellow from his sleep, like Edgar in King Lear, 'Poor Tom's a-cold'. This inn was furnished with not a single article that we could either eat or drink; but Mr Murchison, factor to the Laird of Macleod in Glenelg, sent us a bottle of rum and some sugar, with a polite message, to acquaint us, that he was very sorry that he did not hear of us till we had passed his house, otherwise he should have insisted on our sleeping there that night; and that, if he were not obliged to set out for Inverness early next morning, he would have waited upon us. Such extraordinary attention from this gentleman, to entire strangers, deserves the most honourable commemoration. Our bad accommodation here made me uneasy, and almost fretful. Dr Johnson was calm. I said, he was so from vanity. Johnson: 'No, sir, it is from philosophy.' It pleased me to see that the Rambler could practise so well his own lessons.” The 21st century Glenelg Inn is extremely comfortable. All around this beautiful area ancient walls and ruined cottages can be seen, deserted since the cruel evictions of 1853, part of the infamous Highland Clearances. As you can see from the photo above there are also much earlier ruins, the two Iron Age brochs of Dun Telve and Dun Troddan, fortress-like stone fortified homesteads of Iron Age farmers. Both towers were originally 10 metres tall, round, with several floors and a winding staircase. They were probably used to keep local people safe from invaders, including the Romans. From the top of the tower a watchman could sound the alert and wave a torch so that local families could shelter there with their animals and food. These two brochs were once linked by a tunnel. This is Sandaig, with its burn, beaches and islands, which is also near Glenelg. Gavin Maxwell, author of Ring of Bright Water, called it Camusfearna to try to hide its true location. He was devastated when the success of his book brought gawping tourists and ruined his seclusion. His small cottage was burned down in 1967 and his beloved otter, Edal, died in the fire. 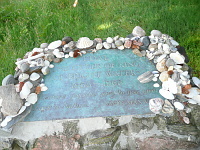 Maxwell’s ashes are buried here. The mystical poet Kathleen Raine, who was unrequitedly in love with Maxwell, also lived nearby. Between March and October you can cross to Skye on the brave community run ferry, run by two men and two enthusiastic dogs. This is where Boswell and Johnson crossed to Skye in 1773 and is far more romantic and exciting than the modern road bridge. The journey only takes about 10 minutes and as you wait for the next boat you can pass the time in the lighthouse, about the size of a sentry box. It’s no longer used but you can buy a cup of tea or a t shirt and there is a testimony to the grim determination of the TV Licensing Authority - a letter from them berating the lighthouse for not buying a TV license. On the Skye side we walked up to a viewing hide where we borrowed binoculars and watched otters, golden eagles and buzzards.